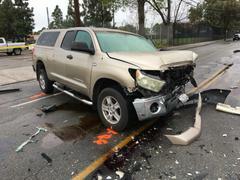 On Sunday, February 10th, 2019 at approximately 5:30am the Santa Ana Police Department (SAPD) responded to the area of Warner Avenue and Oak Street in regards to a reported traffic collision. Upon their arrival, SAPD Officers found two involved vehicles, a white Toyota van and gold Toyota pick-up truck. Orange County Fire Authority (OCFA) personnel responded and extricated the two involved drivers (and only occupants). Both drivers were briefly treated at the collision scene before being transported by CARE Ambulance to OC Global Medical Center for treatment. 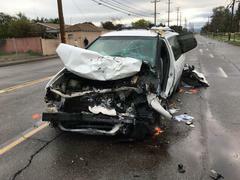 The unidentified female driver of the white van received major injuries and was taken into emergency surgery before she was pronounced deceased at the hospital. The driver of the pick-up truck is being treated for moderate injuries. The preliminary investigation, based off witness statements and evidence, has revealed the pick-up truck was headed east on Warner Avenue when it struck by the white van which was headed west (wrong direction) in the eastbound lanes. 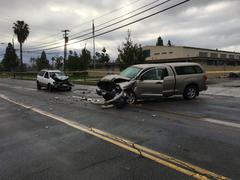 The driver of the gold pick-up truck was identified as Male (62) Santa Ana. The deceased driver of the white van was unidentified and her identity will have to be confirmed by the Orange County Coroner’s Office. At this time, alcohol has been identified as being involved in this collision but further laboratory analysis will have to determine if drugs were as well.